Have you heard? Niantic the Pokemon Go team released limited edition Christmas Pikachu into the wild. These cute Pikachu's will not increase your Pokedex count but comes animated with a red mini Christmas hat. It's super cute and you can keep it in your pocket unless your transfer it away. Super cute! How do you get them? First you have to be playing the game. Next be sure to find the landmark spots in your city! No.1 tourist spots like the Eiffel Tower? A great idea! The city's architectural wonder library? Probably! Small town? No problem. Google (Niantic's map partner and previous parent company) really encourages appreciation for nature, arts and culture (many pokestops are arts, sculptures, landmarks and parks). Visit your local art houses - operas, symphony hall, giant wall murals. 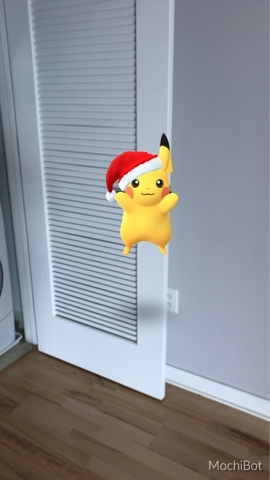 These are great places to find Christmas Pikachu's! In our city - San Francisco, you can find it near the Civic Center performance arts center and Roots an art collective with a giant illustration mural on its side wall in SOMA.